Contact!! Do you remember that TV show? My kids used to watch it on PBS. I just loved it! The challenge at Die Cuttin’ Divas this week is 3-2-1, meaning 3 patterned papers, two embellishments, one ribbon or bow. This was a difficult challenge for me!! The patterned paper part, really, but I pulled through and this is what I came up with: I made the square grid frame in the Silhuette software and the striped paper is just a rectangle behind it. The grass is a border punch, and the hello there is a leftover from another project. I already forgot what file I used for the little bird! Sorry! Hope you try this challenge! 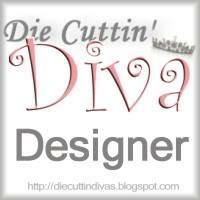 See you at Die Cuttin’ Divas! I created this little blog so that I could have a place to show different crafts that I make for my family, my friends, my students, and myself! I have always enjoyed crafting. I particularly love paper, and that's what I'm currently working with. This entry was posted in Paper Crafting and tagged card, Die Cuttin' Divas Design Team, note cards. Bookmark the permalink. 6 Responses to DCD – 3-2-1! Cute card!! Love the papers and the bird! Ooh, I remember that show! Loved watching it as a kid! 🙂 Your card turned out so pretty Evelyn! LOVE the bird and the papers you picked out! Looks great! What a lovely card!! Love all the pretty papers and the sweet little bird!! Have a great day.